Well, the boy and I have officially survived our first week of school–and by survived, I mean thrived. We have had a great week all around. We both enjoy where we are, we haven’t been tired or stressed out. We are making great time in the mornings. Overall, I am completely surprised at how well it has gone. I’d be lying if I said I spent the summer looking forward to going back to work outside our home full-time. However, here it is, Friday night after our first week, and I’m good. I’m not sad or wishing it were different or counting down days. While we all spend more time apart, our time together is more focused and intentional. 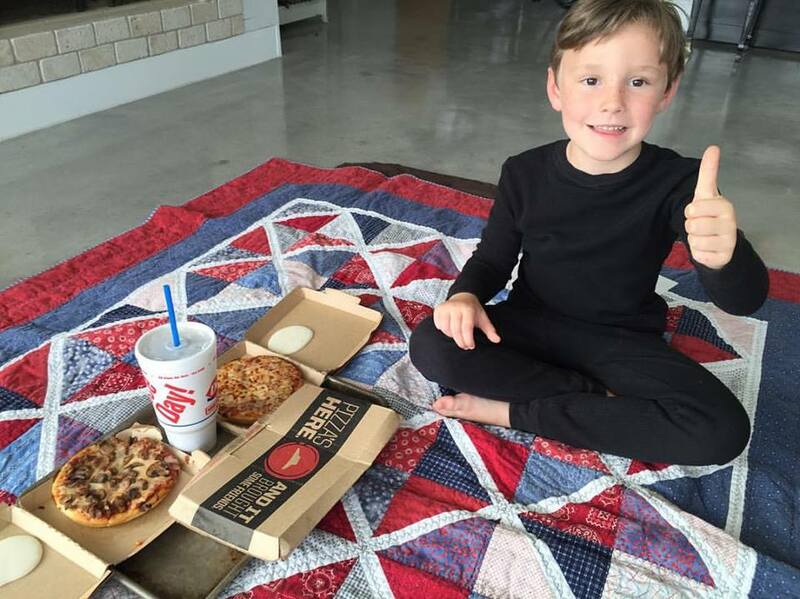 Just this evening, the boy and I camped out on the living room floor with movies, pajamas, pizza, and brownies. We were focused on each other. He told me about things that happened at school this week. He asked about how my school was going. We talked, laughed, snuggled up close, and enjoyed. We agreed on a little later bed time, and then I laid with him for a while when I tucked him into bed. Because I only work a half-day on Friday, Mr. Gray and I have set that time aside for a date lunch. It’s in pen in our calendars. It’s a gimme-date, one we don’t have to arrange or work for. As we rode to the restaurant, we talked about how we thought the week had gone. (Quick back story: I had a TON of anxiety leading up to this week thinking about being gone four and a half days a week and how I would fit everything into that schedule.) We reflected on what had worked well and what needed changing, but most of all, we were in total agreement that overall, it was a success. “It all seems manageable,” he said. “Yeah, but that’s where it’ll get you,” I replied, “once you think you’ve gotten to a point of manageable and start to slack on the systems that you put in place to manage it, you lose the control. We can’t let the snooze button creep in on us.” And it’s totally true. Feeling like it’s all under control leads to letting the standards slide, and then it’s overwhelming. I’ve gone a full week logging more hours than I’ve been out of our home in six years, and I have only been tired once. I hit a wall Thursday afternoon as the day was winding down, but it was nothing that a few jumping jacks and brain exercises with the kids (who were also hitting their max) couldn’t fix. I have had time to rest, relax, and wind down every single day. I know it’s only been a week, but historically, this is the most tiring week of teaching for me. I’m calling it a win–even if soccer is fast-approaching and it might all change soon. So what are we doing that’s working, anyway? (Monday and Wednesday mornings, I work out before all of this and return home at 6:00 to pick up where I would be if it were a “regular” day and I were just waking.) We start our day early, prep the day before, and get everything finished before we stop in the evenings. 3:25: get the boy; post office, bank, town errands, etc. 5:00: Mr. Gray home. We are completely finished with everything by the time Mr. Gray walks in the door. Then we play in the yard, ride the golf cart, play a game, build with Lego, or whatever we want to do from there. It sounds crazy, but it works for us. We are able to optimize our time on task and minimize the lolligagging. Nonna got the boy from school today because he had an early release (earlier than my half-day), and he still walked right in, got out his homework, and got to work. It’s the precedent we have set, and I’m hopeful it’ll carry us through a successful year. Spending the hour when we get home to really focus saves us so much time in the long run. I’m exhausted just reading this! Happy to hear your new routine is going smoothly, though! Happy for y’all! !